For Contractors and “do-it-yourselfers” who want to see & feel a truer test. Great for do-it-yourselfers and contractors with larger projects. These larger pieces can also be cut and used for showing potential customers. 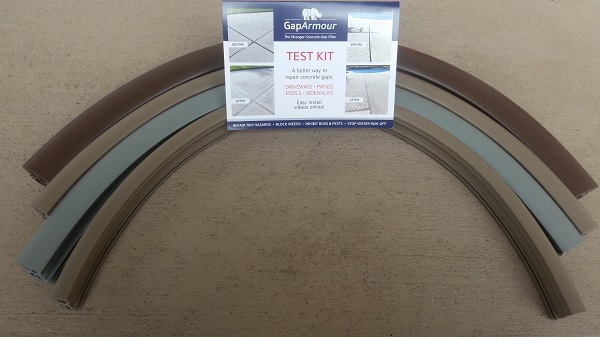 If you are a contractor or a “do-it-yourselfer” that just wants to see what several feet of Gap Armour looks like once installed, this is the kit for you. Contractor Kit includes 20-inch strips (instead of the standard 6-inch strips) of all 4 widths and a mix of all our colors. Order our Contractors test kit and get four 20" long strips instead of the 6 inch strips in our standard test kit. Armed with 4 width sizes, you can confidently find the width you need for each expansion joint in your project. No need to use a tape measure or ruler to determine size - simply pop each test piece in and instantly determine the one that provides a snug fit that completely seals up your expansion joints. Custom Cut: Once you use the test kit, you may find that you need several sizes for your project. NO problem, we will custom cut to the lenght you need. Simply measure up the total length of each size and we will cut one continuous length for you. Our longest continuous run is 100ft, so if you order 125ft of 1" Adobe, then you would receive one coil of 100ft and a second coil of 25ft.